NEW WEB SITE, BLOG AND VIDEO COMING SOON! An exciting new edition to the award winning Masters on the Fly Series from Wild River Press! Muskie on the Fly will attract adventurous fly fishers to the pursuit of the muskellunge and cause traditional-gear muskie fishers to take up the fly rod. With great detail on the species, great fly patterns for the chase, detailed instructions on technique, and color illustrations and photographs throughout, Robert Tomes leaves out nothing of importance. At long last — a book that deals with this exciting and often overlooked game fish. Guru Tomes knows how to tackle this legendary fish of 10,000 casts and now he shares his secrets with us. Muskie on the Fly will shorten your learning curve. Whether you chase muskies with a fly or conventional gear, this book is a must! This is a big, handsome book that makes sense of an arcane subject. I've done just enough muskie fishing with a fly rod to know that the information here rings true. Having seen a muskie slash off a weed line on Webster Lake to take a streamer author Robert Tomes was casting, I am now a believer. But not everybody has the opportunity to see the thrilling take in person. 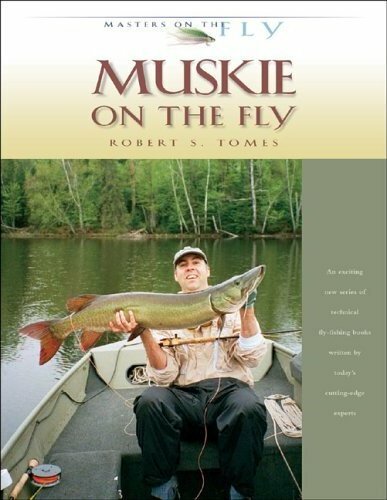 Guiding readers through the culture of muskie fishing, then enticing them into the subculture of fly fishing for the fabled freshwater predator is Tomes's gift in Muskie on the Fly. He demystifies muskie fishing in general and builds a case why fly fishing is at times a better option. And he does it by combing basics — flies, rods, lines, approaches, waters, guides — with personal experiences and guide tales that is a hybrid rare in the outdoor press. I have faith: This is a fishing bible.